Blackpool 226 is a double-end, double-truck, center entrance, open top streetcar, unique to Blackpool, England known as a “boat car". English Electric’s Preston Works built 226 as part of a series of 116 new Blackpool trams constructed between 1933 and 1939. Twelve of these new trams were open top boat cars (225-236). No. 226 arrived in August 1934, and with its sister cars saw regular use carrying tourists on the round town Circular and the famous Promenade routes. The Circular route ended with World War II, but resumed in 1957, ending for good in 1961 when the Blackpool town routes started to be discontinued. Four of the class were scrapped in 1968, but the other eight survived and were renumbered 600-607. No. 226 became 601, a number which it carried from 1968 to 1971, when it was withdrawn for sale to the Bay Area Electric Railroad Association. It arrived in San Francisco in October 1971 intended to run on that city’s Market Street, as part of British Week celebration. A dock strike prevented the tram’s unloading in time for the celebration. When No. 226 was finally unloaded it went straight to its new home, the Western Railway Museum. Number 226 did see Market Street service in 1983, as a participant in the Trolley Festival. 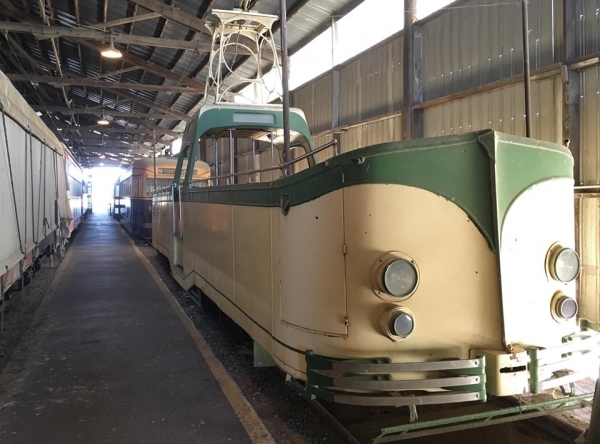 It was returned the Western Railway Museum in 1985 after San Francisco’s MUNI had purchased from Blackpool its own boat car, No. 228. No. 228 had not been used in Blackpool since 1978, when it returned from Philadelphia after the 1976 Bicentennial. Five boat cars remain in Blackpool and three are in the USA, 226, 228 in California and 235 in the Trolleyville USA (Cleveland) collection. They are always popular cars (unless it rains) and are all in original condition, the only major modification was the fitting of windscreens in 1959. Current Condition: This car is in good condition, but is currently out of service due to a defective traction motor. Proposed Future Treatment: The traction needs to be repaired; then maintain the car in operational condition.